"We are responsible for the world in which we find ourselves, if only because we are the only sentient force which can change it." In this statement from his 1972 essay No Name in the Street, James Baldwin sums up a philosophy that drove much of his work. Baldwin was continually conscious of the hypocrisies and injustices in the world around him, and as a writer, he strove to make his audiences aware of the possibility that people could do, and be, better. An expatriate most of his adult life, Baldwin nevertheless wrote tirelessly about the contradictions inherent in American identity, and especially about the state of American race relations. He came to be respected as one of the sagest intellectuals in the Civil Rights Movement and as a leading figure in the African American literary tradition. Baldwin was born in Harlem in 1924. Shortly after his out-of-wedlock birth his mother married David Baldwin, a factory worker and Pentecostal minister, and Baldwin was raised in their home along with seven younger half-siblings. His troubled relationship with his strict, domineering stepfather colored much of his childhood, and Baldwin turned to reading as a means of escape. At Frederick Douglass Junior High School Baldwin edited the school paper and belonged to the literary club, whose adviser was poet Countee Cullen. At 14, his literary career was temporarily challenged by a new vocation when he became a junior minister at a Harlem storefront church, drawing crowds bigger than his stepfather's. Three years later he decided to leave the church and Christianity, but throughout his career he was described as a prophet, and his work is ripe with biblical cadences and imagery. After his high school graduation in 1942, Baldwin took a series of odd jobs in New Jersey. But when his stepfather's death and the Harlem riots occurred during the same 24-hour period in the summer of 1943, the trauma of the two events spurred him to return to New York, where he settled in Greenwich Village, determined to concentrate on his writing. During the winter of 1944-1945 he met the celebrated black writer Richard Wright, who became a mentor and father figure to him, and who recommended him for the Eugene Saxton Fellowship that he received in 1945. Until that time Baldwin had been working only on an unpublished draft of a novel, but in 1946 he published his first essay in the Nation. He soon became well known as an essayist, publishing in the New Leader, Commentary, and Partisan Review. 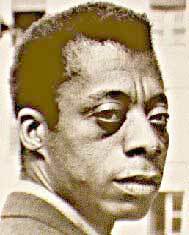 In 1948 Baldwin was awarded a Rosenwald Fellowship, and used the prize money to buy a one-way ticket to Paris. He left New York on November 11, 1948. As an openly gay African American, Baldwin had long felt stifled by the prevailing racial and sexual prejudices in the United States. The 1948 trip marked the beginning of his career as an expatriate writer, and while his writing often returned to American subjects, he was based abroad for most of the next 40 years. In Paris, though he lived as a struggling artist, his friends included French writers Jean-Paul Sartre and Simone de Beauvoir and fellow American expatriates Saul Bellow, Truman Capote, Beauford Delaney, and Wright. Baldwin's 1949 essay "Everybody's Protest Novel" and 1951 essay "Many Thousands Gone," however, both of which criticized Wright's Native Son, created a lasting break in that friendship. But by then Baldwin was well on his way to establishing his own identity as a writer. Baldwin finished his long-awaited first book, Go Tell it on the Mountain, during a stay in his companion's Swiss hometown, and published it in 1953. The novel, a largely autobiographical account of his teenage years, received critical acclaim, but his next two novels caused controversy. Giovanni's Room (1956) and Another Country (1962) featured characters struggling to define sexual, racial, and national identities, and the matter-of-fact depictions of gay relationships in both books surprised many readers. During the same period, however, Baldwin also published three collections of essays, and it was the nonfiction books - Notes of a Native Son (1955), Nobody Knows My Name (1961), and The Fire Next Time (1963) - that secured his reputation as an important American writer and social critic. Through his essays, Baldwin developed a reputation for being a shrewd and prophetic commentator on American culture, particularly about racial identity. As one critic explains, these three books - each of which sold more than a million copies at publication - "won Baldwin a popularity and acclaim as the `conscience of the nation,' who brought to racial discourse a passion and honesty that demanded notice . . . Baldwin's knife-edged criticism of the failed promises of American democracy, and the consequent social injustices, is unrelenting and demonstrates a piercing understanding of the function of blacks in the white racial imagination." During this period, Baldwin's trips to the United States became more frequent. He visited the American South for the first time in 1957, and during the 1960s was one of the most public intellectuals in the Civil Rights Movement, lecturing and speaking out at such forums as a meeting he arranged between Attorney General Robert Kennedy and black celebrities including Harry Belafonte, Lena Horne, and Lorraine Hansberry. It was The Fire Next Time, whose publication coincided with the 1963 March on Washington and the hundredth anniversary of the Emancipation Proclamation, that earned Baldwin his national reputation as a prophet. Baldwin took the book's title from the lines of an old spiritual - "God gave Noah the rainbow sign/No more water, the fire next time" - as he argued that American race relations were in danger of reaching violent conclusions. Many readers interpreted the riots that occurred in American cities throughout the late 1960s as the fulfillment of Baldwin's warnings. But Baldwin had concluded that essay on a hopeful note, suggesting that "if we [blacks and whites] do not falter in our duty now, we may be able . . . to end the racial nightmare, and achieve our country, and change the history of the world." This optimism about the possibility of reconciliation in American race relations had been expressed even more strongly in some of his earlier essays, and it created a rift between Baldwin and many younger African Americans - most notably black nationalists such as Eldridge Cleaver, and the more militant black writers who were associated with the Black Arts Movement. But even as his politics began to be criticized, Baldwin kept writing. Baldwin's 1955 play The Amen Corner and 1964 play Blues for Mr. Charlie were both successfully produced on Broadway. Baldwin's other publications in the 1960s included Going to Meet the Man (1965), a collection of short stories, and the novel Tell Me How Long the Train's Been Gone (1968). In the 1970s his books included the essay collection No Name in the Street (1972) and the novels If Beale Street Could Talk (1974) and Just Above My Head (1979). By then, Baldwin was again recognized and embraced as a major figure in African American literature, and he lectured and taught at several American colleges and universities between the late 1970s and mid-1980s. In 1985 he published The Evidence of Things Not Seen, a collection of essays on the 1980-1981 Atlanta child murders, and The Price of the Ticket: Collected Nonfiction, 1948-1985. When Baldwin died in France of stomach cancer on December 1, 1987, he was at work on a play and a biography of Martin Luther King, Jr. Baldwin's memorial service at the Cathedral of St. John the Divine in New York City drew thousands of mourners, and writers from Maya Angelou to Toni Morrison spoke of his profound impact on their own work. As Amiri Baraka said in his eulogy, "This man traveled the earth like history and its biographer. He reported, criticized, made beautiful, analyzed, cajoled, lyricized, attacked, sang, made us think, made us better, made us consciously human."